The differences between the twin drawings vs Prima and Secunda are rather obvious but there are many subtle differences as well. I believe the Prima and Secunda drawings to be linked to the one-way wheel because they are so different from the twins and from clues within the text keys. Bessler discovered the two-way wheel about three years or so after he found the one-way wheel. While working on the two-way wheel he apparently published nothing and that is a tragedy. His first publication Grund came out a few months after his two-way wheel discovery and he dedicated the vast majority of his verbal and print commentary from that point on to the two-way wheel alone. That makes researching the one-way wheel especially difficult because you look at hundreds of pages of documents and possibly come away with a quip or two. The reason this is so disappointing to me is that the one-way wheel would seem to be easiest to discover. I am confident that some people do not agree with my belief in Prima and Secunda being the one-way wheel because of the apparent textual connection to the Weisenstein wheel. A close examination of the phrase preceding the text key for Prima leans more in my direction. In German it says: The perpetual motion demolished, externally like the one in the Castle Weissenstein. In Latin it says: Perpetual motion according to the same exterior face as the construction in Castle Weisenstein. The best research method to use seems to be to find everything possible about the two-way wheel and compare and contrast it back to the scant few clues available on the one-way wheel. The one-way wheel is, in my opinion, the MOST important thing!!! All it will take is one or two creative minds to finish this. A. Shows the size of the machine / circumference and profile. E. The rope through which the water snail flows. F. A square wheel on the snail over which the rope runs. G. The water-snail itself / run through the perpetual mobile. H. The water box in which the snail dives. I. Here is one of the openings of the snail which draw the water. K. The other opening of the snail / and where she empties. L. The water runs out of the snail and pours forcefully into the wooden channel. Q. The out running water runs in a funnel through the hollow throat in the floor. R. Out of the funnel the water runs in a spout. 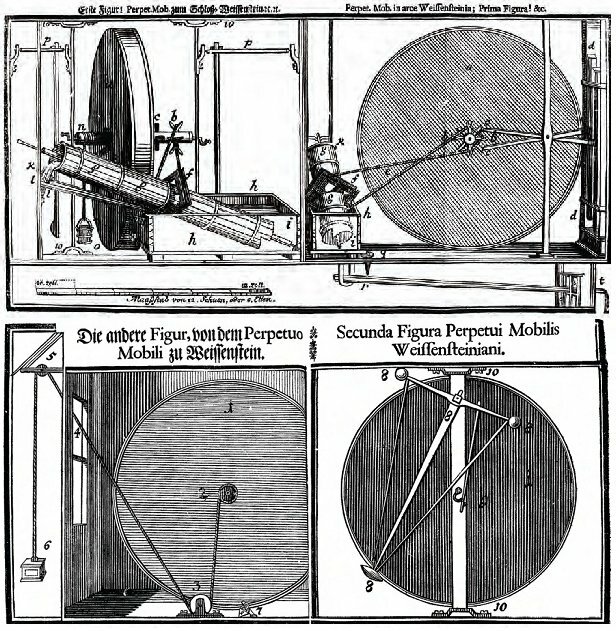 The total size of the wheel / or perpetual mobile. The arms and vertical support beam that connect the pegs at the center of the wheel to the stampers in Prima are not labeled or mentioned in the text which makes them more likely irrelevant than important. The arms are not exactly drawn correctly either. The arm that is higher on the left side of the support beam is the closest to the observer. The higher board on the right is also in front. These boards would have to have about a twenty-five degree bend in each arm according to the drawing. The arm to the lower left of the support beam points straight down the line of the rope going to the top of the water pump. There is also the unique coincidence that the angle of the crossing arms lifting the stampers and the crossing rope pulling the water pump are the same. Did you notice there is no letter j in Prima above? It might have something to do with the near identical appearance with the German letter ”i”. J does happen to be the tenth letter and the number ten was used for something special but it may have just been a coincidence. According to real world measurements of the one-way wheel it has a diameter to thickness ratio maximum of 20:1 (Its diameter is twenty times longer than thick) but the two-way wheels average 10:1. A ten foot diameter wheel with only 6 inches of thickness is too narrow for movement of a weight in any direction except one with an axle parallel with the main shaft. Basically a wheel within a wheel. From practical experience the hardest thing to work with is a weight that moves forward or backward from a radial line out from the axle. The two-way wheel is twelve to eighteen inches thick so there should be room for a very different type of movement if arm number eight is really shoe sized. A one-way wheel going clockwise, only lifts one weight at a time, at or just before the three o'clock position. The one-way wheel only has two perpendicular cross arms with weight mechanisms at their ends for a total of four weights. The locks in both the twins and Secunda appear to be latches that hold the weights or arms for a period of time. The latch on the twins engages thirty-five degrees after bottom center and Secunda's latch catchs ten degrees before bottom center. You can send email or suggestions to: me -at- mikeyned.com.